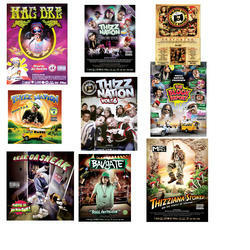 (10-Posters) The Thizz Nation poster pack includes 18" x 24" posters of Mac Dre - 16 Wit Dre, Thizz Nation Vol 5, Thizz Nation 6, Thizz Nation 7, Mac Mall - Thizzania Stoned, Mistah F.A.B. - Self Titled, Keak Da Sneak - Self Titled, Bavgate - Still Instagatin', Mac Dre Presents - The Block Report, plus a bonus myster poster! Monster 10 poster pack for the low price of $19.98!